I'm new to Arduino and driving stepper motors in general; please excuse me for my limited knowledge on the subject. I've been doing research for a few hours already, looking into powering stepper motors and the Arduino, though I've gotten conflicting information regarding my problem. My problem, or well question if you will, is as follows: The circuit I need, simplified, contains an Arduino, a stepper motor driver (DRV8825), a NEMA17 5kg.cm stepper motor and a 12V battery pack (yet to be decided what kind of pack, though it will be 12V). Do I need another, lower voltage, battery pack? As you can see, it only has a single power supply (with capacitor to catch voltage peaks). 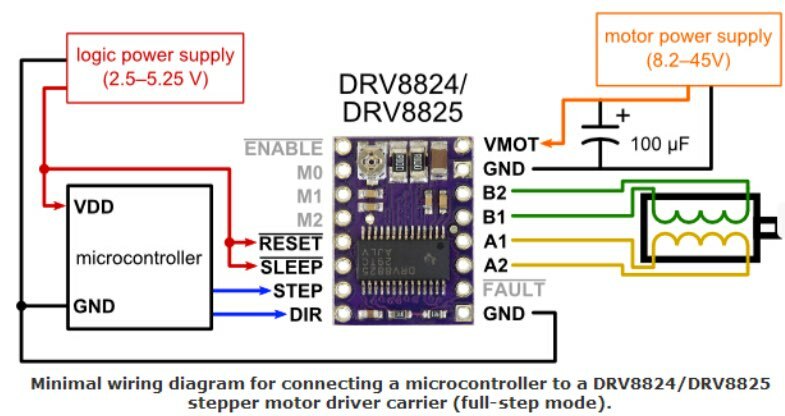 I understand most of the circuit, though one question remains: why exactly is there only one power supply being shown here, is it because the Arduino can get its power from the driver? (You can see the pin descriptions in the second image below) Or do they simply not show the (5v) power supply for the Arduino? The thing I want to know, is whether this circuit would function without an external power supply for the Arduino or not? And if not, would connecting the Arduino to the power supply via the VIN pin work? That would be nice, as it would offer a simple way of fixing the problem instead of getting a separate power source. Connecting the Arduino through USB wouldn't work for my project, as it can't have any wires coming from it. It needs to be completely mobile. I'm a first years mechanical engineering student, hence my little knowledge on Arduino's and stepper motors. why exactly is there only one power supply being shown here, is it because the Arduino can get its power from the driver? No. It is assumed that you will provide the power to the Arduino yourself - either through the USB connection to the computer, or through the barrel jack. The thing I want to know, is whether this circuit would function without an external power supply for the Arduino or not? No. The Arduino requires power to be provided. And if not, would connecting the Arduino to the power supply via the VIN pin work? Yes, but it's not ideal. At 12V the power wasted by the on-board linear voltage regulator will be proportionally high. As long as all that is being powered is the Arduino itself that shouldn't be too bad, but if you try to draw any significant current either out of the 5V pin or through multiple IO pins (for example to drive lots of LEDs) then it will overheat and potentially shut down. A more ideal arrangement would be to connect a 5V switching regulator to the 12V battery and use that to power the Arduino either through the 5V pin or the USB connector. Personally, I use cheap UBEC modules from RC model suppliers. They are small, low-cost, and very easy to wire up. Not the answer you're looking for? Browse other questions tagged power motor stepper or ask your own question.